When talking to ourselves, what if we were a little more supportive? I identify with this self-criticism habit and know others who do so as well. It is so easy to find fault with one’s self. One habit that helps me turn off that “critical inner voice” is to provide encouragement and support to others. To turn from inward to outward, to turn from self-criticism to praising others. 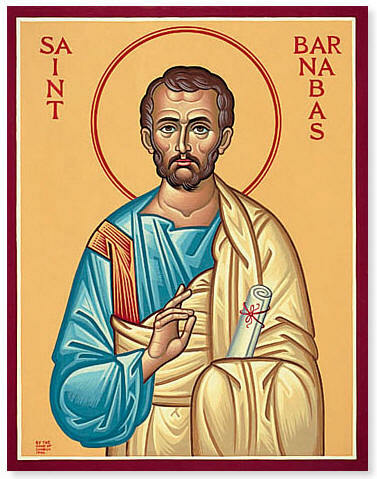 My Biblical model for this is Barnabas, a little known early church leader. He is first mentioned in Acts 4:36. His original name was Joseph; he was Jewish religious official from the island of Cyprus. On his conversion to faith in Jesus he sold a piece of property that he owned and gave it to the church. He was quickly renamed Barnabas, which means “son of encouragement” because he so freely support others. He supported Paul after his rocky conversion. Paul had first persecuted the church and the early leaders were skeptical of Paul’s conversion. Barnabas stood by him as a kind of sponsor/mentor. Barnabas accompanied Paul during their first missionary journey (Acts 13:2) and the great council in Jerusalem (Acts 15). Then Barnabas was willing to split with Paul when Barnabas wanted to encourage and support John Mark in spite of John Mark’s spotty record. Barnabas lived a vibrant life of encouragement and exhortation. I have discovered my own need to have several “Barnabas” in my life. My colleague and friend, Pastor John Straiton, has always given me passionate support during my ministry, both by prayer and encouraging words. My friend Tim has kept my running and biking in spite of injuries and struggles. And many members and friends of Resurrection have given me words of encouragement and support in my first months here. I am so thankful for these gifts. How do you give encouragement to others or yourself? This entry was posted in Bible, love, spiritual exercise and tagged Barnabas, encouragement, Seth Godin on April 14, 2011 by Pastor John Keller.